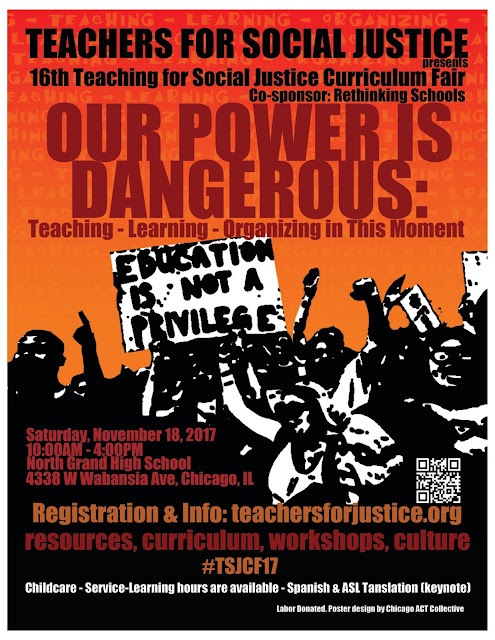 16th Annual Teaching for Social Justice Curriculum Fair! Our Power is Dangerous: Teaching-Learning-Organizing in This Moment. The 2017 Curriculum Fair Registration is OPEN! ALL are welcome!, and we ask for a $5-10 donation at the door. TSJ is a 100% volunteer organization that turns 20 next year! Every Curriculum Fair is organized by ALL OF US together! Click HERE to register!! And you can volunteer on the registration form. See you NOVEMBER 18th! We have finalized our workshops and are quite excited about them--from early childhood to adult education; from fighting the attack on Black teachers to supporting white teachers to fight racism; from a youth space to cultural spaces in multiple languages; from fighting Islamophobia and the new cop academy, to learning about the Puerto Rican debt crisis and the new, mandated (in CPS) Burge-torture-victims reparations curriculum--these are some powerful workshops that will help us all TEACH-LEARN-ORGANIZE in this moment! You do not need to sign up for specific workshops ahead, but you DO need to register for the CF if you haven't already! 1. #NoCopAcademy-Assata's Daughters. Room 203. 2. Students Defining Social Justice-TSJ. Room 265. 4. Teach In: Stop the Deadly Exchange-Jewish Voice for Peace (Chicago). Room 207. 5. Where are They Now? Exploring the Decline of Black Teachers-Dr. Aisha Wade-Bey, Tara Stamps, Dr. Monique Redeaux-Smith. Room 208. 6. Building a People's Education Movement: Strategies for Movement Building Within and Across Local Struggles-People's Education Movement Chicago. Room 209. 7. Stepping Back: Self Care in Teaching-Goodman Theatre. Room 210. 8. Back to Biliteracy-Books del Sur. Room 212. 1. The Work of White Educators: Anti-Racist Teaching-Learning-Organizing-TSJ. Room 203. 3. Urban Nature-Inspired Arts-Borderbend Arts Collective. Room 207. 4. LGBTQ+ Issues in Education: Understanding, Inclusion, and Advocacy-Dr. Gloria Alter. Room 208. 5. Liberating ESL Classrooms: Using Small Writing Groups to Foster Dignity, Consciousness, and Collectivity-Community Writing Project. Room 209. 6. Se Acabaron Las Promesas: Resistance in the Face of Austerity and Crisis-Chicago Boricua Resistance. Room 210. 7. Reparations Won: Teaching the New CPS Curriculum-Chicago Teachers Union. Room 214. SEE YOU ON SATURDAY NOVEMBER 18!!! 10:00 AM SHARP! AND DON'T FORGET YOUR WATER BOTTLE! Description: A Conversation with Angela Y. Davis and Ruthie Wilson Gilmore, moderated by Beth Richie. All seats for this event are full! If you RSVP’d but will not be using your seats after all, please let us know ASAP as there is a waitlist for this event. Email Jess@criticalresistance.org. Description: Are you organizing to get police out of your school? Working on responses to harm in the classroom and staffroom that do not involve criminalization? 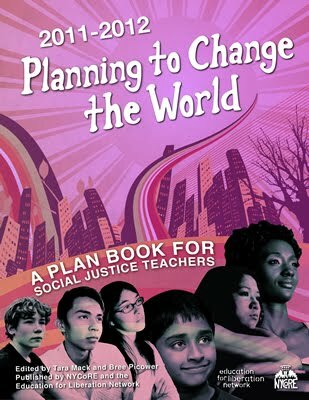 Want a curriculum that creates possibilities to imagine and build a world without prisons and borders? Building to protect students and families from immigration enforcement (ICE)? Description: An event on resisting criminalization, gang databases, and policing. We will feature the launch of a critical new report on the use of gang databases in Chicago. Community organizers will discuss past efforts to fight policing and criminalization. Together we will build abolitionist visions of expansive sanctuary in Chicago. 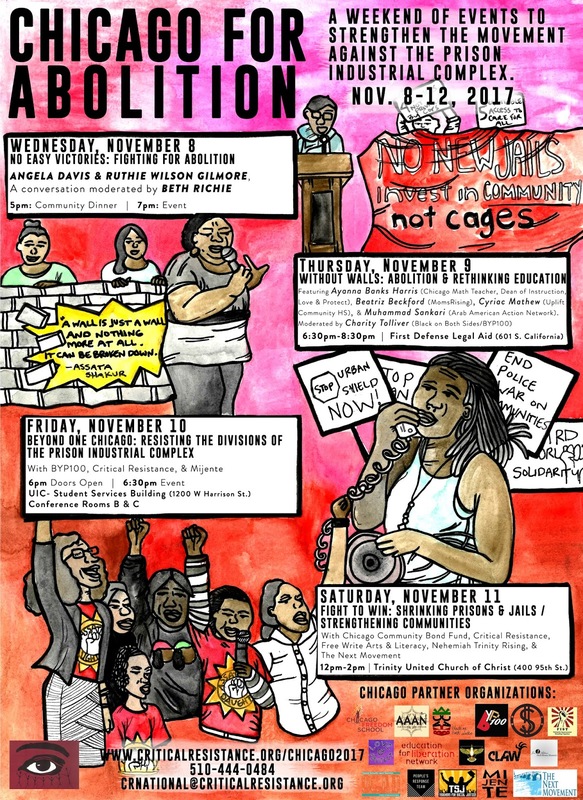 Featuring BYP 100, Critical Resistance, Organized Communities Against Deportation (OCAD), and Mijente. Description: Fight to Win: Shrinking Prisons and Jails / Strengthening Our Communities will be a workshop-style event build sharpen our knowledge of organizing against imprisonment and strengthen strategies to fight for a world without cages. We will explore and discuss successful campaigns around stopping jail construction, ending money bail, advocating for prison closure, and for supporting prisoner-led struggles. This event is hosted by Chicago Community Bond Fund, Critical Resistance, Free Write Arts & Literacy, Nehemiah Trinity Rising, and The Next Movement. Time: 12pm - 2:30pm; We’ll provide some coffee and light brunch food. Info about venue: We will be meeting in the in the "Open Space" which is the large central room in the center of CFS, on the 4th floor. CFS is just south of State and Balbo next door to Pauly's Pizza. There are stairs only from the entrance off of State Street. We have an elevator in the back which can be accessed from the alley, right next to the parking lot. Ring the buzzer that says "Chicago Freedom/ICAH" and someone will buzz you in. Thank you to the Chicago for Abolition partner organizations: Black on Both Sides, BYP100, Chicago Community Bond Fund, Chicago Freedom School, Education for Liberation, FIST - Formerly Incarcerated Students Together, Free Write Arts and Literacy, Love & Protect, Mijente, Nehemiah Trinity Rising, Organized Communities Against Deportation (OCAD), People's Education Movement, Teachers for Social Justice, and Trinity United Church of Christ. Thank you to the Chicago for Abolition sponsoring organizations! Broadway Youth Center, Chicago National Lawyers Guild (NLG), Chicago Torture Justice Memorials, Decarcerate Marion County/No New Jail Coalition, Familia Trans Queer Liberation, For the People Artists Collective, Illinois Deaths in Custody Project, Jane Addams Hull-House Museum, Jewish Voice for Peace, John Marshall Law School- National Lawyers Guild, Lifted Voices, Moms United Against Violence and Incarceration (MUAVI), National Black Food & Justice Alliance, PASO- West Suburban Action Project, People's Response Team, Project NIA, The Next Movement, Transformative Justice Law Project of Illinois, and Village Leadership Academy.